The large island of Sicily is a part of Italy yet apart in its history, culture, food and wine. Here is some advice on how to enjoy Sicilian food and wine when you visit, or at home wherever you are. There is only one region which has been awarded the highest level, the Cerasuolo di Vittoria DOCG. Many of the wines from other regions are made and marketed as DOC. 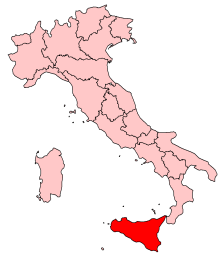 The following list comprises all of the DOC regions in Italy. I highly reccomend this map. It is a great educational resource and it is also a beautiful frameable map of 24 x 36 inches. It would be ideal on the wall of your cellar or dining room. 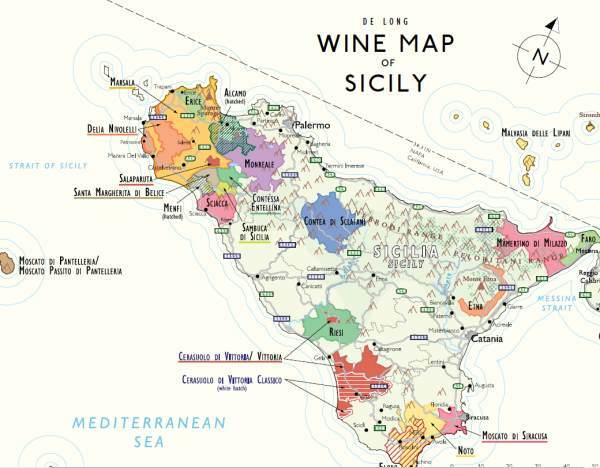 The image below is of a map of Sicilian wine regions by Steve De Long. You can download it as a pdf file and expand it to any size you want. It is much clearer than the image below. Get your free copy of this wine map of Sicily by going to De Long Wine Info and looking under Free Resources. Sicily's position in the middle of the Mediterranean and its rich history of contact with other lands has left a huge diversity of varieties used. Many are believed to have been introduced by the Greeks who occupied much of Sicily for centuries before the Romans arrived. 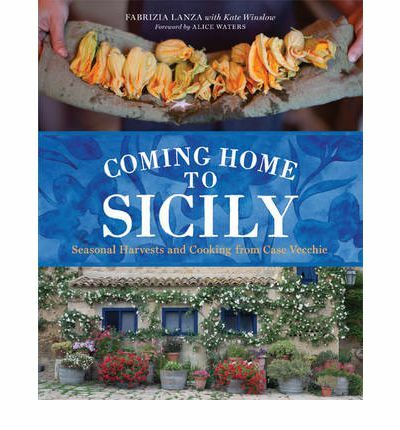 The the traditional foods of Sicily are influenced by history and geography. The island has been under the influence of the Greeks, Romans, Saracens, Normans, Spanish, to name just a few. It's position surrounded by the Mediterranean Sea and in the south of Italy with an abundance of sunshine allows the cultivation of many fruits and vegetables - most notably eggplants, tomatoes, citrus, olives and of course grapes and grain.